Steel Union Pipe Fittings. It is available in DIN, SMS, ISO, 3A, RJT, IDF standards. 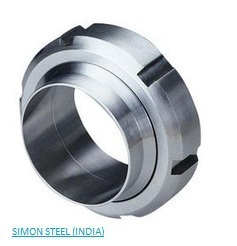 ASTM / ASME SA 312 GR. TP 304, 304L, 304H, 309S, 309H, 310S, 310H, 316, 316TI, 316H, 316LN, 317, 317L, 321, 321H, 347, 347H, 904L. ASTM / ASME SA 358 CL 1 & CL 3 GR . 304, 304L, 304H, 309S, 309H, 310S, 310H, 316, 316H, 321, 321H, 47 . ASTM / ASME SA 790 UNS NO S 31803, S 32205, S 32550, S 32750, S 32760. ASTM / ASME A 53 GR. A & B, ASTM A 106 GR. A, B & C. API 5L GR. B, API 5L X 42, X 46, X 52, X 60, X 65 & X 70. ASTM / ASME SB 111 UNS NO. C 10100, 10200, 10300, 10800, 12000, 12200, 70600, 71500.